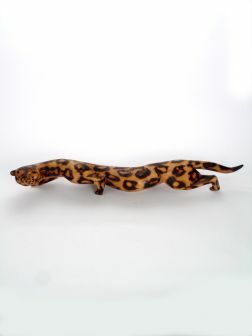 Carved from a single piece of non-indigenous, non-endangered hardwood, like Jacaranda, these wood animals are beautifully polished and carefully crafted. The leopard is a symbol meaning ferocity, valiance and courage. Our painted wood pieces combine the elegant and simple look of wood carving with a vibrant and colorful style of hand painting. Much care is taken in the carving and finishing of a product, and this same care is extended to the selection, maintenance and delivery of these fabulous one-of-a-kind sculptures. Comes in 2 sizes: 22 or 30 inches long.